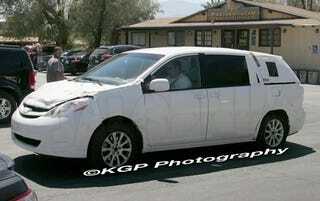 According to KGP, this is a prototype of the 2010 Toyota Sienna. We're actually really thankful for this information, because we don't know much about the Sienna except that it's Toyota's long-running entry in the minivan market and that it's scheduled to be replaced with an equally unexciting but slightly different model. Actually, we'll just let you read KGP's analysis for the full story on the upcoming people-hauler. Hit the jump for the full story. We caught this disguised Toyota Sienna prototype testing in the desert. The prototype appears to utilize most of the current Sienna's bodywork, so we initially thought it was facelift of the current Sienna. But there are some very rough sections which seems to point to this as a mule for the next-generation Sienna. Judging from the construction and packaging of this prototype, it would appear that Toyota product planners are content to stay with a package similar to the current Sienna, with all of its traditional minivan cues. While many other automakers are bailing from the minivan product segment with line-blurring crossovers, it looks as if Toyota will stand toe-to- toe with Honda and Chrysler to slug it out for the attention of soccer moms everywhere. Given the minimal changes visible to overall architecture of this mule, our best sense is that Toyota may be sticking with the current Sienna's platform, albeit with significant updates, in order to save costs.